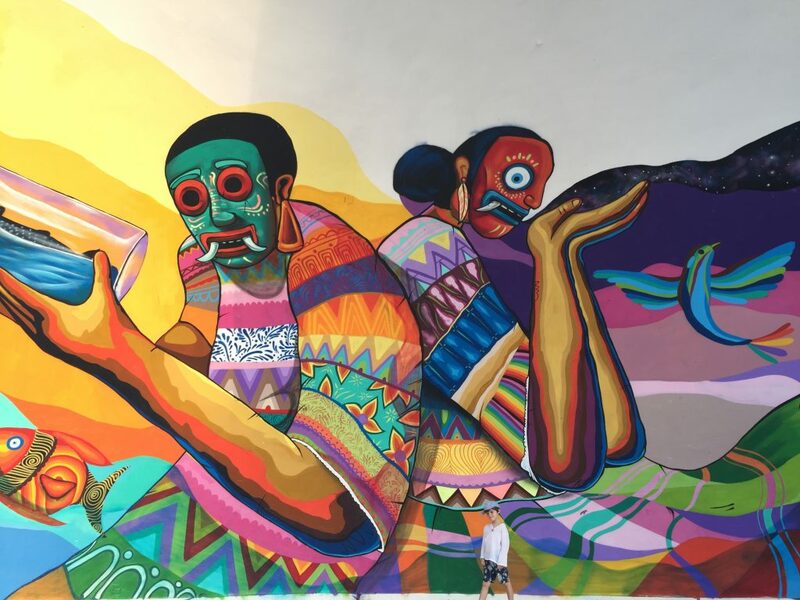 Mexico has been on my bucket list for many years and it didn’t disappoint. We spent 12 nights in Mexico (2 weeks in total including our return flights from the UK) and drove over 1,500km. 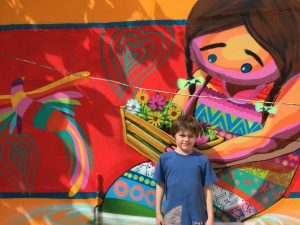 Would I recommend Mexico as a family destination? Absolutely. 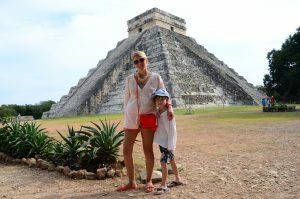 Mexico has a fabulous mix of culture, historic sights, activities and scenery that will suit families with kids of all ages. 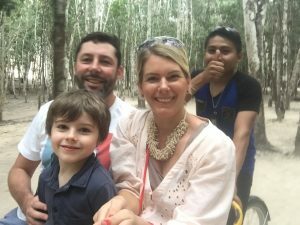 We visited historic cities, relaxed on beautiful beaches and booked onto some amazing trips, including zip lining through the jungle. 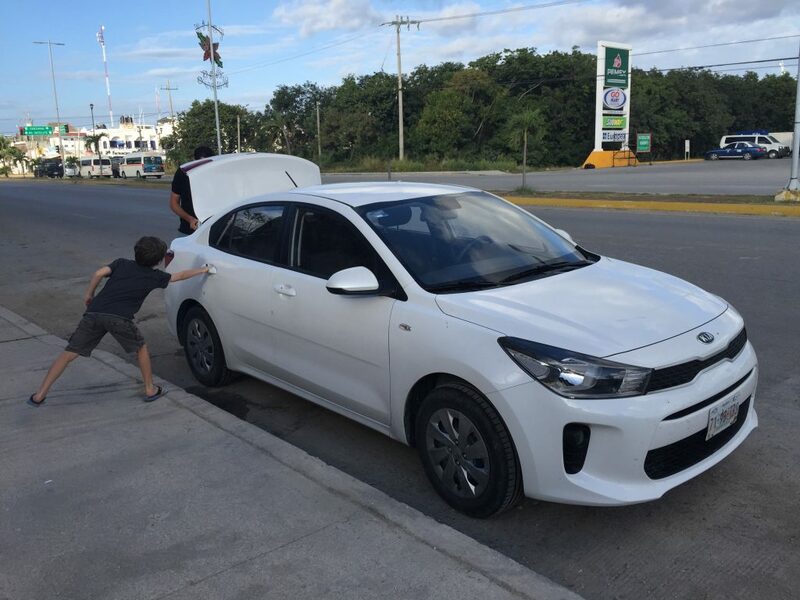 This is the Our Tribe Travels practical guide to a two week road trip in in the Yucatan Peninsular. 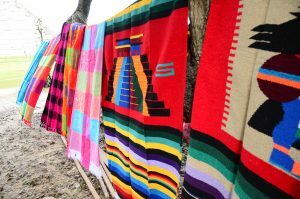 The Yucatan Peninsula is hot year-round. The two distinguishable seasons are the wet season and the dry season. The wet season usually starts in June and ends in October, making the dry season generally from November through May. The weather in the dry season is much more desirable and pleasant for most tourists, hence why the Christmas period is their peak tourist season. The dry season is still hot, but much more tolerable than the wet season as the nights are considerably cooler. Please bear this in mind when choosing your accommodation as we stayed in a few places that didn’t have air con or ceiling fans. This was absolutely fine in December when the nights are cool, but in the summer months this environment would be unbearable. The humidity in the summer months makes it feel excruciatingly hot most days, especially to those who aren’t used to a humid climate. In the wet summer, it actually rains most days. Similarly to most tropical weather patterns the rain comes in heavy, short spurts usually towards late afternoon. There are many car hire companies to choose from, many of which are global brands, but we opted for the local company MEX. This was by far the cheapest option and was absolutely fine. 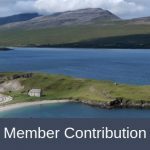 We paid £270 for 12 nights, unlimited mileage and two drivers. The car exceeded our expectations – it was very new Kia saloon automatic with only 5,000km on the clock. Mex operate a shuttle service from the airport to the car hire depot. which is a few km away from the International terminal. We did have to queue for 45 mins to complete the paperwork, but we were travelling in late December which is their peak holiday season. My advice is fill up when you can as it’s feasible to drive 150km and not see a petrol station OR the petrol station is closed OR has run out of petrol. 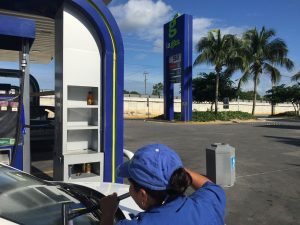 If you’re driving South on the 301 highway fill up in the main cities (Cancun, Playa del Carmen and Tulum) as once you head further south the petrol stations become less frequent. There is one just outside Mahahual, but we were advised that this station regularly runs out of fuel, so don’t rely on it. Mexico has many American tourists and therefore accepts American dollars alongside Pesos. However beware! The currency conversions for American dollars is appalling and you can expect to pay up to 350% more than if you pay in Pesos. 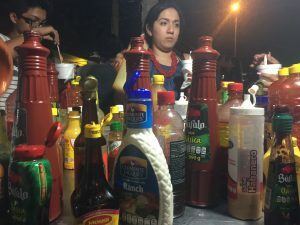 Many of the menus in areas that have a big proportion of American tourists have two menus; one in USD and one in Pesos. 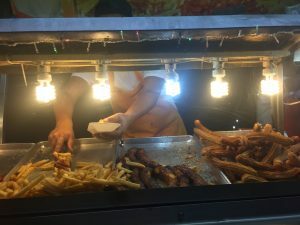 I compared two of them and a bottle of beer in Pesos was equivalent to USD1.5, but on the American menu the cost for a beer was USD5! In the two weeks that we were in the Yucutan Peninsular we only saw two banks; one in Cancun and one in Tulum. Cash points can be found in the supermarkets and in the entrances to some of the bigger historic sights. Although we don’t like to carry too much cash when we travel, we quickly learnt that if we saw a cash point that had money in it, take it out. Some of the machines will only allow you to withdraw a maximum of 7,000 pesos (circa USD365). This is worth bearing in mind if you are staying in accommodation that doesn’t accept cards. Try and plan ahead. The two main brands to look out for are OXXO and Six. 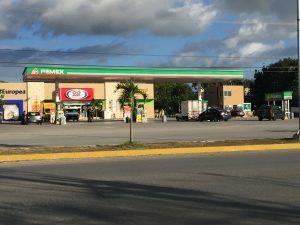 OXXO is the prominent and larger supermarket and you will find this in most towns that you visit. Both stores stock infant products (nappies, wipes and baby wash etc.) and have coffee machines (just in case you’re a coffee addict like me!) and snacks. 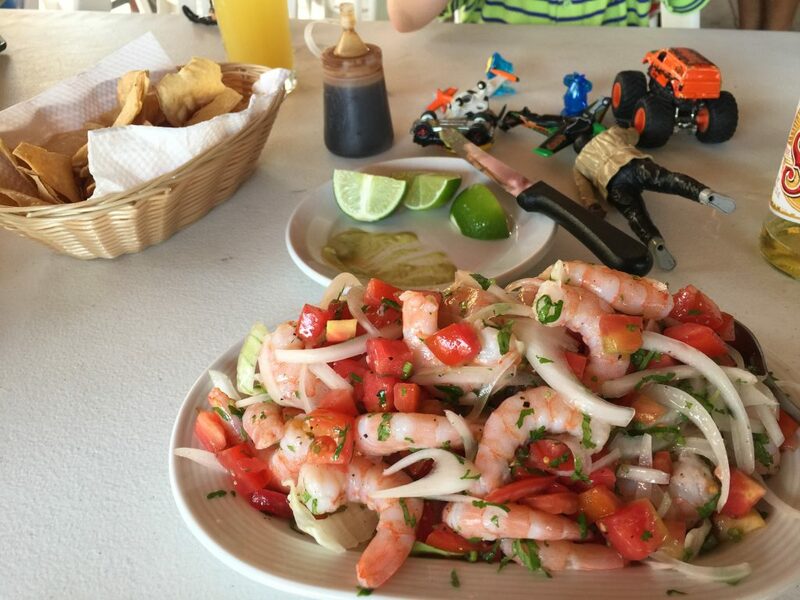 We loved the Mexican cuisine and there’s plenty of food choices to suit the fussiest of children. The spicy salsa and chills are often served separately from the dish, so if your child doesn’t like spice then this is not an issue. We also noticed that there were many Italian restaurants and a lot of local places would offer a couple of simple pasta dishes on their menu. We flew into Cancun. 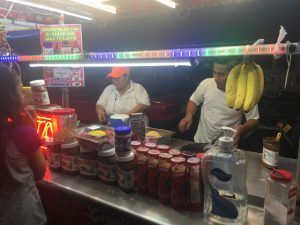 I’m not a fan of typical package holiday destinations, so we only scheduled 16 hours here, but the highlight was the local evening market called El Parque de las Palapas (10 Margaritas, 22, Cancun). 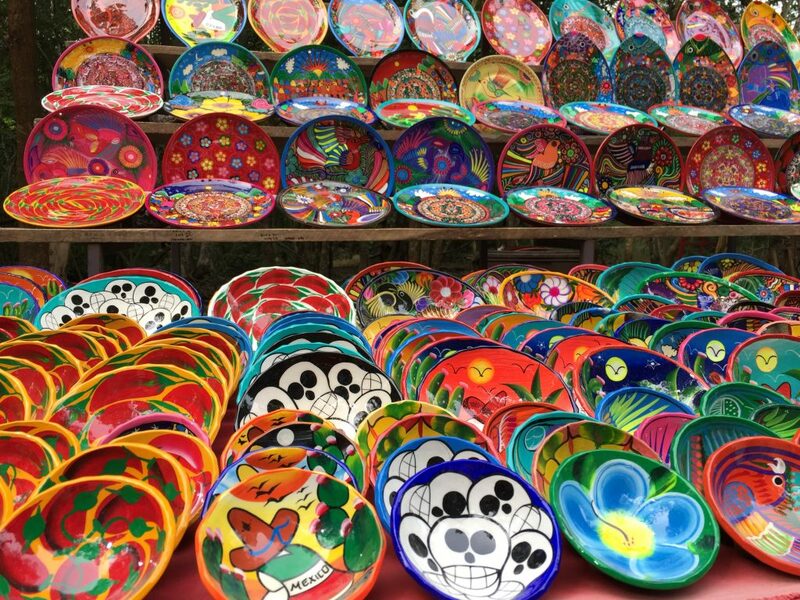 The outdoor market is located in downtown Cancun and is a popular spot for local families to congregate. There are food stands, local market traders and kids activities so it’s a brilliant spot for soaking up the local vibe. The highlight for me was the local music. A traditional mariachi band played in the communal eating area – it was vibrant, cheap and cheerful and the perfect start to our holiday. It’s difficult to park on the streets surrounding the market as it gets very busy, but it’s easy to find a parking spot in the neighbouring streets. 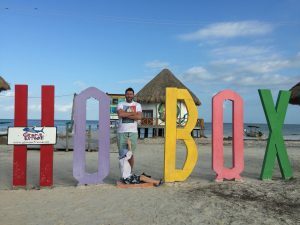 Holbox is an island in the Mexican state of Quintana Roo and is located approximately North West of Cancun. The island itself is very small; a strip of island that is only 1.5km wide and 40 km long. It’s separated from the mainland by 10 km of shallow lagoon that is home to flamingos, pelicans and other birdlife and has become a popular destination during the summer months as a place to spot whale sharks. Chiquila is the ferry port that services Hotbox island. The town is very small and as drive through towards the boats lots of the local people will try to flag you down to get you to park on their premises. We parked at Panchos. Pancho has a very well organised, covered parking lot. You can’t pre book, but if you can’t get in here then there are plenty of other options. To get to Panchos follow the highway, which will end at a Pemex petrol station. Turn left (after going around the roundabout) and you’ll be at the port. A handful of places near the port offer overnight parking; they are very basic but they are safe. 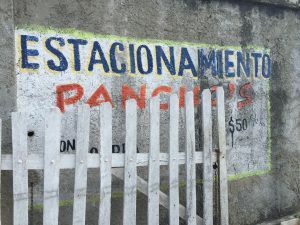 Panchos’ board states that he charges 50 pesos per 12 hours, but he only charged us 50 per 24 hours. Payment is due on collection. The ferry leaves on the hour, every hour, but get there a little bit earlier as if it’s busy it will leave as soon as it’s full. 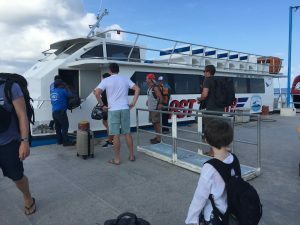 The ferry is 140 pesos for adults and 90 pesos per child (one way). There’s also a fast ferry service, but row standard one only takes 25 minutes anyway so I wasn’t sure what the real benefit of the fast one was! 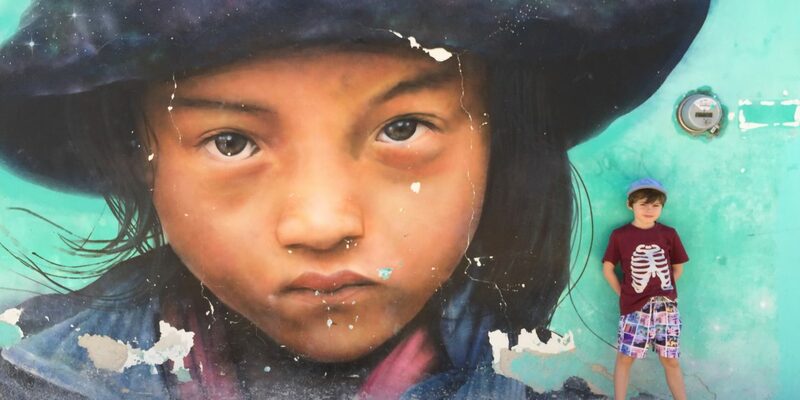 The island of Holbox still holds the rustic charm of a destination that hasn’t been fully developed. We like this, but if you prefer to destination to be more manicured then Holbox probably isn’t the right destination for you. The beach isn’t as stunning as the caribbean coastline but it’s very shallow and calm – perfect for families with young kids. 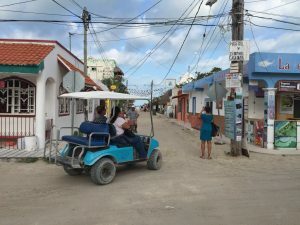 The central area is full of eateries, little shops and colourful wall murals and the island is car free so, with the main mode of transport being gold buggies. This makes it really easy to wander around with kids. Golf buggies can be booked by the hour or by the day. PLEASE ENSURE THAT YOU TAKE CASH TO THE ISLAND. There was one working cash point on the island but it was empty for the first 2 days of our holiday. On day 3 it was filled but the queue to take money out was huge (we waited 2 hours). Some of the cafes do take cards, but the majority of the island is cash only. There’s also a money exchange but they only change cash (dollars and euros) and do not allow you to take money from a card. The slow and laid back feeling on the island. It’s a place to meander and relax and the central area is so small it’s easy to walk around, even with little kids. There are many boat trips that you can take from the island to view the wildlife. We were offered a free child place with two paying adults, without even trying to negotiate, so prices are flexible. There are some fabulous little local cafes serving delicious food. We try and opt for the smaller local places where the menu is limited but cooked fresh to order. The beach did have a strange sulphur smell, but you do get used to this after 30 minutes. The island caters for all levels of accommodation, from basic hostels, airbnb rooms, boutique guest houses up to 5 star, low rise and tasteful resorts. We opted for an Airbnb room which was located a 10 minute walk from the shops. 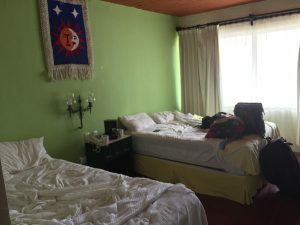 It was perfectly fine with a large room and shared kitchen facilities but I’m not listing it here as I know there are better options closer to the beach. 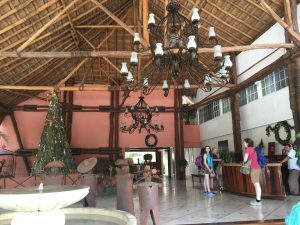 There are a few big 5 star hotels very close to Chichen Itza, but most of the accommodation is located in Piste, 2 km down the road. 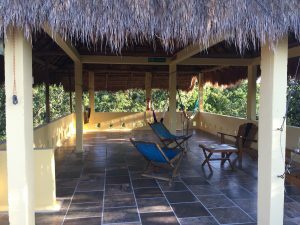 We stayed in the Hotel Chichen Itza, Piste which we booked via Airbnb. The hotel is located in Piste and is a couple of kilometres walk away from Chitchen Itza. The hotel has an outdoor swimming pool, sunbeds and simple bedrooms. A member recommended that we only stay for one night and I would echo this. 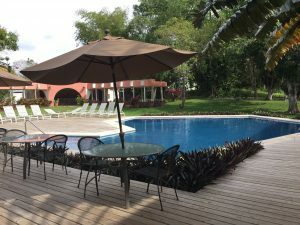 There isn’t a great deal to do in Piste so I recommend arriving in the afternoon, heading to Chichen Itza first thing the following morning and then driving straight on to your next destination. Top Tip – The local OXXO store in Piste has a coffee machine and a seating area. You can buy pastries in the shop and eat them there at a fraction of the cost of the hotel breakfasts. There’s a cash point on site in the main entrance. Top tip – The car park and ticket office open at 8am. If you head there first thing and there are no queues and it’s also a lot cooler. We spent 3 hours walking around the historic monuments and when we exited the queue for tickets was HUGE, with circa 200 hundred people waiting to get in. Not ideal in the hot sun. 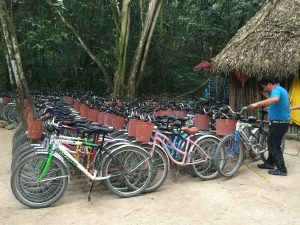 You can hire bicycles (@ 50 pesos per bike) or pay for a tricycle and a cyclist – the monuments are spread over a few kilometres so these can be hired for a fixed price @125 pesos return fare. You can climb some of the monuments, but you have to start climbing prior to 16.30 as the day ticket entry closes at 17.00. 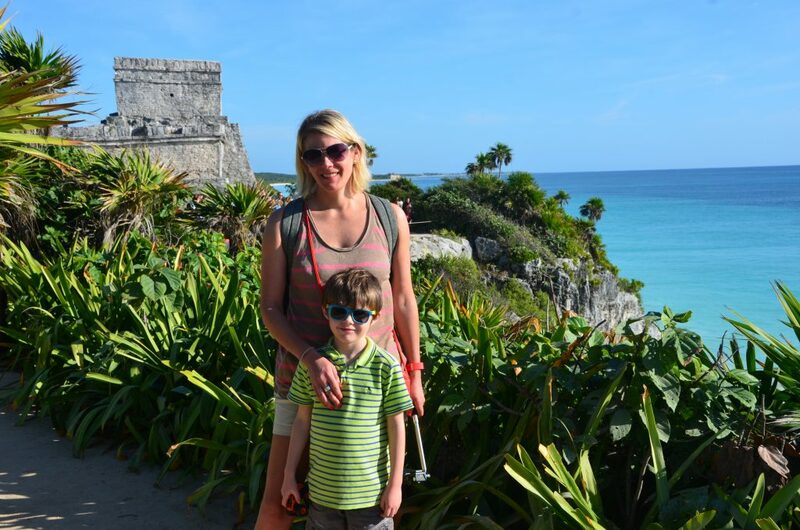 Tulum is well known for its beaches and well-preserved ruins of an ancient Mayan port city. 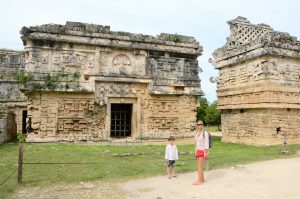 The area surrounding Tulum caters for families and has many activities that suit all ages. There are boat trips, snorkelling sessions, cenotes swimming, zip lining and a beautiful beach to play on. 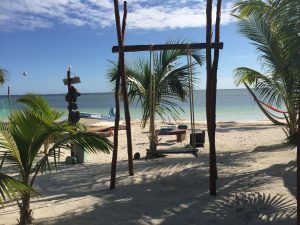 Accommodation ranges from budget hostels and homestays up to high end Premium boutique hotels, in fact the entire beach front on Tulum beach is flanked with stunning low rise boutique villas and rooms. The best way to describe the beach area would be Boho Chic. 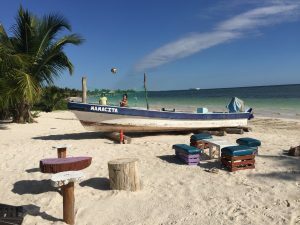 Tulum town is also becoming gentrified with organic cafes and boutique eateries adjacent to local cafes and bars but there are a lot of places to explore close-by. If like us you are more conservative with your accommodation budget then there are many airbnb options in the area, but be mindful that the town area to the beach front is circa 2km. You can hire bikes, which many people do, or if you are without a car there are plenty of taxis available. Along the main highway there are many local minibuses that you can flag and jump in really cheaply. You rarely have to wait more than a few minutes, so this is great service if you are relying on public transport. 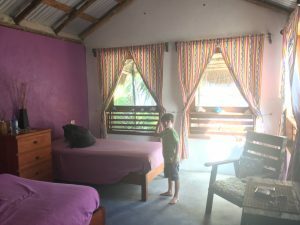 We stayed in a lovely Airbnb circa 15km north of Tulum town. Dos Ojos Lodge Room, Rt 307. 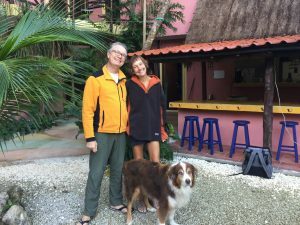 Dos Ojo Lodge is located on the grounds of the famous Dos Ohos Cenotes, so if this is on your ‘must do’ list then this is the perfect place to stay The American hosts are a lovely, friendly couple who take a lot of pride in their homestay. The rooms are spacious, very clean and have an en-suite bathroom. Breakfast is included and served in the communal outdoor kitchen area. Home made muffins, cereal, yoghurt, fruit and fresh coffee are provided. There is a lovely rooftop terrace with hammocks and deckchairs – the perfect place to relax and also an amazing location for star spotting and during the summer months their small plunge pool is open. If you are happy staying outside Tulum then I highly recommend staying here. 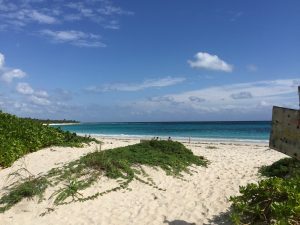 Located circa 20km north of Tulum, this protected beach is beautiful. Car parking is limited and is free, providing you pay a small donation to the conservation centre. There are toilets and showers, but no shops or cafes so bring a picnic and plenty of water. There’s a lovely shaded area in the palm trees to cool off under and an open cenotes to swim in, which is free of charge, but limited to circa 30 people at a time. As we only spent 3 nights in the area we decided to combine a few activities into one day. 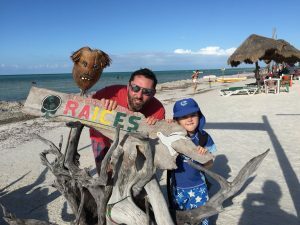 We opted for the ATV jungle ride, zip lining (minimum age is 5 or 7 depending on the zip-line company), rappel, rock climb, snorkelling in 2 x cenotes (one cave swim) and snorkelling with turtles on Akumal beach. If you have transport and want to book directly with each establishment then it’s simple to do or if you prefer to combine a number of different activities and be ferried around in a minibus you can book via an operator who will match you with families who have kids of a similar age. We booked with EdVenture and although it is more expensive than booking directly the equipment that you are given (wetsuit, life jackets, snorkels, flippers etc) are of a really good standard and new. I read a lot of negative reviews where some of the smaller companies don’t invest in their equipment and aren’t able to provide life jackets for smaller children. 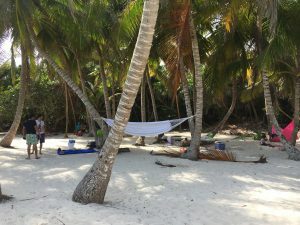 Tour company: http://edventuretours.mx (one of the companies that has been granted access to the turtle snorkelling site). http://www.selvamaya.travel – book the zip-lining, cenotes snorkelling, rappel and rock climbing directly with Selva Maya. The 13th-century, walled Mayan archaeological site at Tulum National Park overlooks the sea – it’s a stunning location. It incorporates the clifftop Castillo, built as a watchtower, and the Templo de las Pinturas. Inland, the archaeological site has pyramid-shaped temples with views over the surrounding jungle. As with Chichen Itza, get to the gates early (pre 8.30am), to avoid the big queues. The guide books all rate Akumal beach as one of the most beautiful main beaches in the area, but we preferred the stretch of beach at Tulum. The sea is calm and shallow in Akumal, so better suited to younger kids, but overall we thought Tulum was far more picturesque and a lovely location for a meal. Our final leg of our road trip was a 4 night stay on a quiet beach south of Mahahual. Mahahual is a village on the Costa Maya. Previously a fishing village, it is now a rapidly developing tourist center and is becoming a regular cruise ship stop. We chose a location 5km outside of Mahahual as we wanted to escape the big crowds, but still have access to amenities if we wanted them. If you’re planning to visit the area then you can plan around the cruise ship days using the following website. Our Airbnn was rustic, basic, but just perfect for a few days of rest and relaxation. Lanazul Buceo, Mahahual. 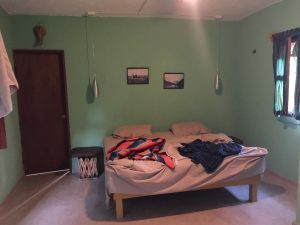 Located on a small quite stretch of beach this Airbnb only has three rooms. We stayed in North room which we loved. Please note that North and South Rooms are directly on the beach and great if you have kids. Their West Room is at the back of the property. Please note that the adjoining stretches of land are not occupied so the seaweed and debris that gets washed onto the shore isn’t maintained. Some people may find that this is an eyesore. There is a small rustic kitchen that you can oder basic food and drinks from (including beer), but if you prefer to cook yourself you can use the facilities for $5 per day. 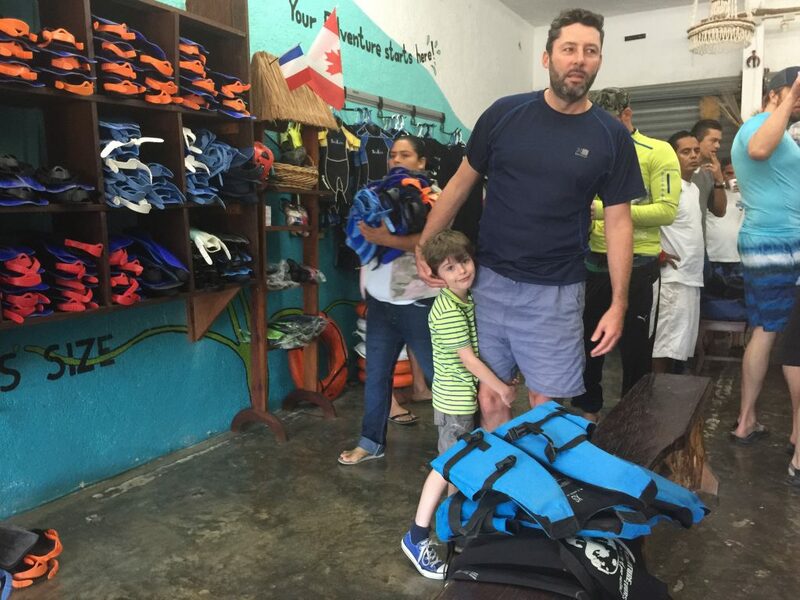 There are also kayaks and life jackets, including small ones for little kids, that you can take out to the reef free of charge. We loved our time here but I would only recommend staying here if you have a car as you have to drive 5km down a bumpy dirt track to access it and many taxi drivers are reluctant to take the fare. Our simple beach front room in Mahahual, Mexico. Cash – take cash out of the cash points whenever you get the opportunity as they are hard to find. Petrol – top up your petrol tank before leaving a major town as the further south you travel the fewer stations there are. Historic Ruins – get there early to avoid the HUGE queues. Negotiate – as with many countries you are expected to haggle a little bit on price. Most stalls / street sellers and tours will account for this in the first price they give you. 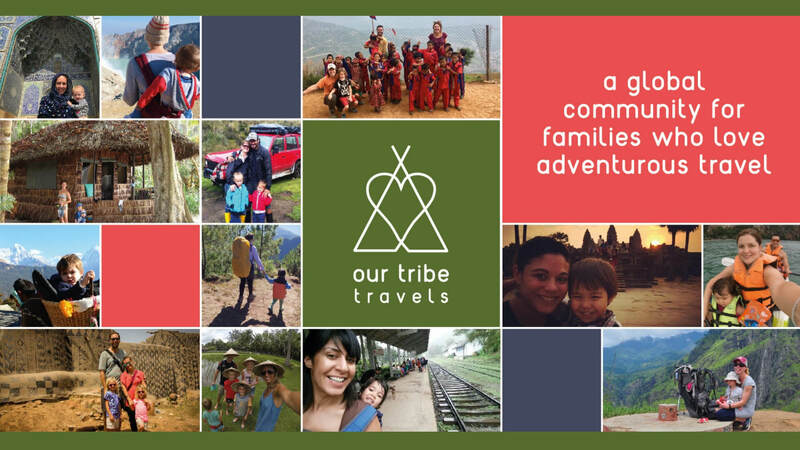 Thank you for the comprehensive blog and wonderful pics that really helped us plan our trip!